In case of serious economic difficulties, countries can slow down, halt and even reverse some of the progress, but those measures must be time-limited, objectively necessary and proportionate, adopted after meaningful engagement with those most affected by them. They cannot be discriminatory, and must mitigate inequalities and ensure that the rights of the most disadvantaged people are not disproportionately affected. 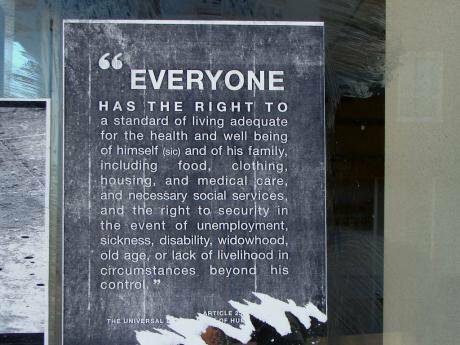 These are the requirements of the human right principle of non-retrogression. But tax and social security cuts since 2010 have not met the mentioned requirements of non-retrogression, a briefing recently written by the social rights NGO Just Fair for the House of Commons Work and Pensions Committee shows - and therefore these cuts breach the rights to social security and to an adequate standard of living This means that the UK is infringing the International Covenant on Economic, Social and Cultural Rights (Articles 9 and 11) and the European Social Charter (Articles 12 and 13), both of which have been voluntarily subscribed to by the UK. Brexit will not change that. “Welfare reforms” have been particularly harmful for people that struggle the most to make ends meet. Researchers have found a clear correlation between the increase of food bank use and the rollout of Universal Credit, and between food bank use and benefit sanctions. The House of Commons Public Accounts Committee denounced the “unexplained variation” in the use of benefit sanctions in different parts of the country. Reflecting on the role of sanctions in getting more people to work, the Work and Pensions Committee concluded that “at best, evidence on the effectiveness of sanctions is mixed, and at worst, it shows them to be counterproductive”. Both this Committee and the National Audit Office criticised the government for not doing enough to assess the impact of sanctions on people on low incomes.